My final TMNT Macro Series cover for IDW is Raphael. This marks my 17th Turtles cover for IDW, and it has been a pleasure to do them all. 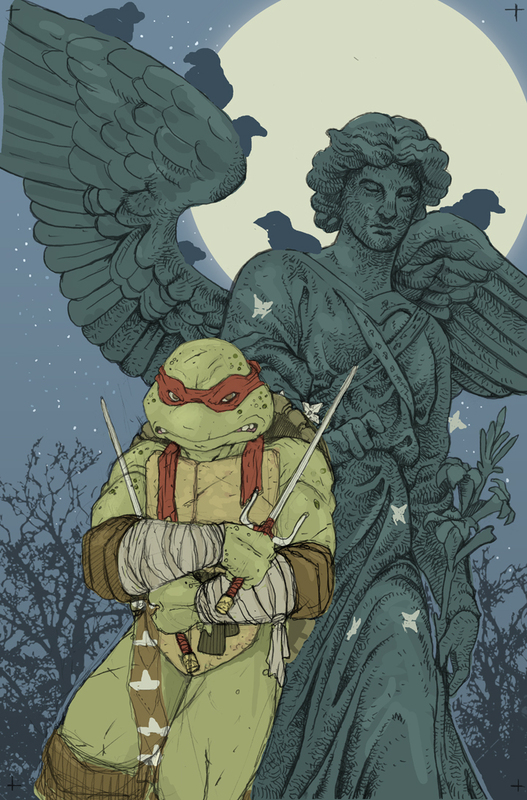 My first TMNT cover was of Raphael, so to end this round with him feels a bit full-circle. To see my past TMNT covers click here. The finished art for the Raphael cover is on the left, but below I'll walk through the steps to create this cover piece. As with the other Macro Series covers, editor Bobby Curnow provided me an outline of the events of the issue, but also gave me free reign to do something 'classic'. Part of the Raph story takes place in Central Park. And since the other 3 covers in this series have their locations as a main element in the composition, picking the right Central Park monument was key. I toyed with The Dairy, The Carousel, Belvedere Castle, and Columbus Circle monument...but opted for the juxtaposition of the Angel of the Waters atop the Bethesda Fountain. 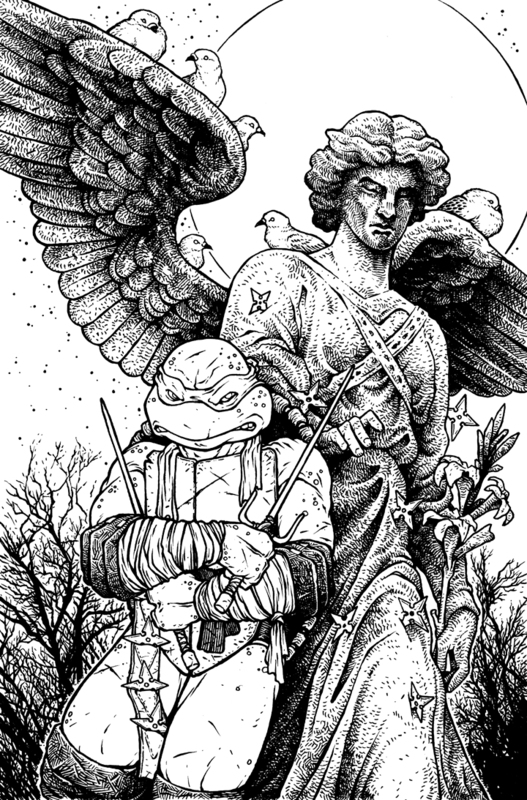 Raph was drawn on copy paper (2 sheets, I redrew one arm and his sai) and the Angel of the Waters was drawn from a reference photo. All of these drawings were scanned into photoshop composited (with some digital pigeons, & ninja stars along with some stock photo trees) and then quickly painted to help me 'see' the final composition and to make it easier for the editor and Nickelodeon understand what I was doing. I printed out the above layout and taped it to the back of a sheet of Strathmore 300 series bristol. On my light pad, I was able to see through the bristol surface to the printout, and I used that as a guide to ink from. I used Copic Multiliner pens...mostly the 0.7 nib. Translating the texture of the shading on the statue was the tough part. Knowing how far to go. I like the soft nature of my pencil version more than the inked one...but sometimes, that happens. 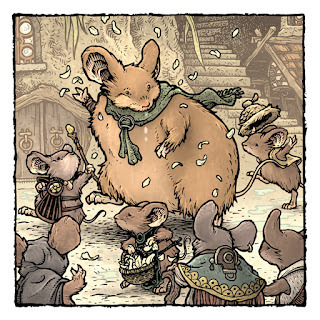 Once the inks were finished I scanned the original artwork to start the coloring process. This step is called 'flatting' where you digitally paint in the colors (could be the final palate, could be made up colors) to establish what areas are different colors from one another. 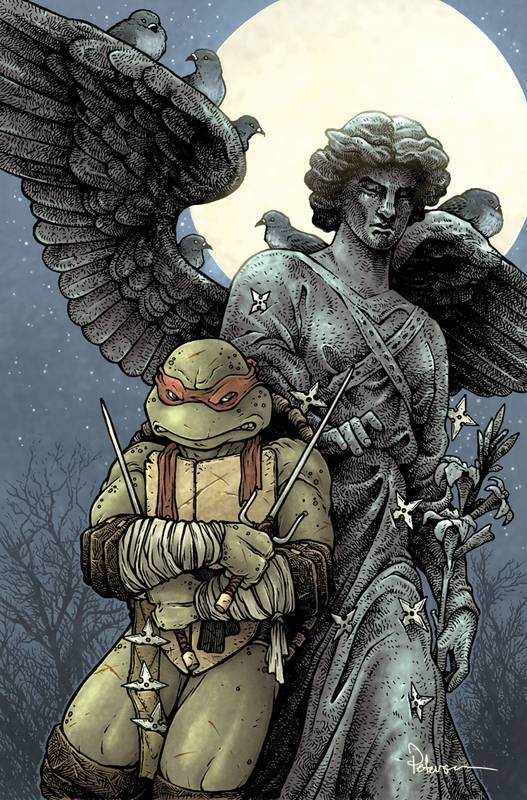 Raph's skin is different from his front shell, and that's different from the sky, or the pigeons, or the statue, or his pads or arm wraps. In this step I also added color holds (areas I wanted the ink work to be a color and not black) to the moon's outline, the stars, and the trees. The final step was to render all the color. I did this step live over on my Twitch channel. I do all of the highlighting, shading and texture using the dodge and burn tools in Photoshop and a stock brush. I did add some more color holds on Raph's cuts and also some glowy bits on the edges of the statue & pigeons in front of the moon. ...oh...and I just found out, I'm doing another cover for this series...the trade! 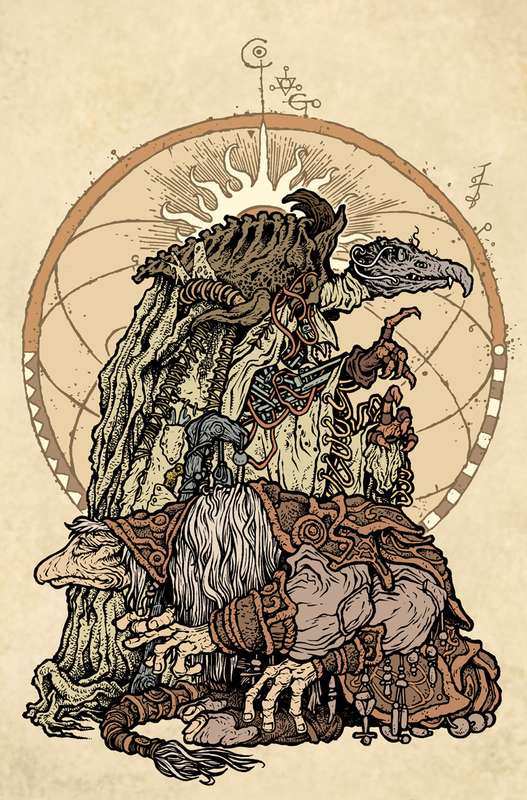 I have been hired by Archaia to do a run of 12 variant covers for the Dark Crystal comic series: Beneath the Dark Crystal. 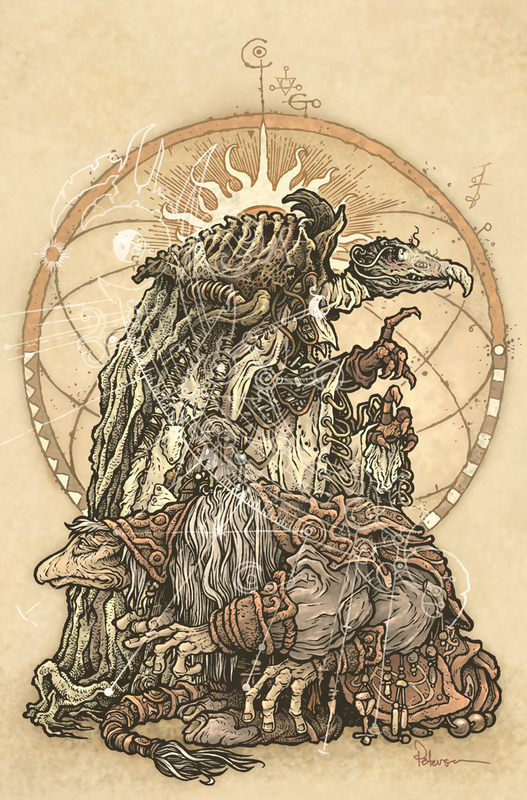 This is my fourth cover of the series where I feature a pair of the yin and yang Mystics & Skeksis. 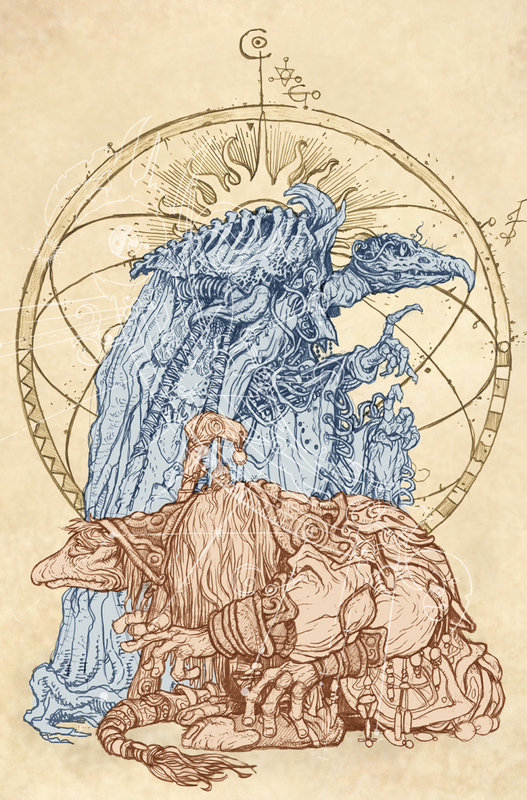 To see my previous Dark Crystal covers click here. 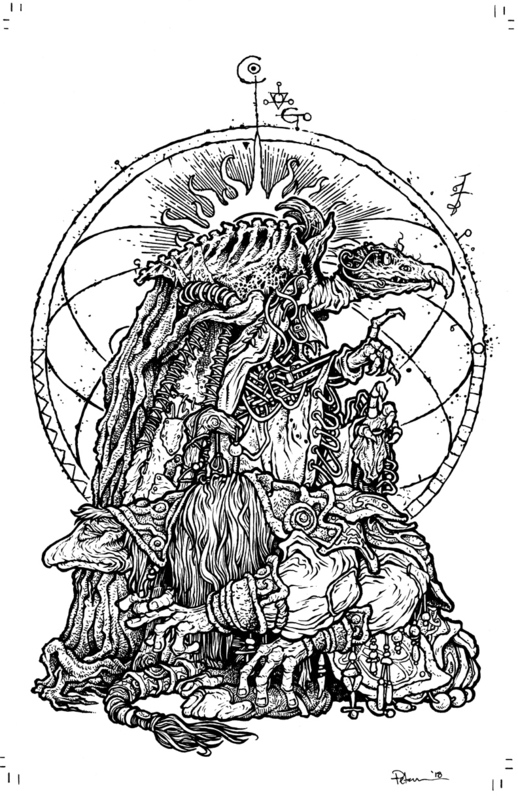 To the left you can see the finished cover art of UrTih the Mystic Alchemist and skekTek the Skeksis Scientist. Below I'll go step-by-step through the process of creating the piece. I started with pencil drawings on copy paper. I like using copy paper to draw composition elements because I'm not precious about it...if I don't like the way a drawing is turning out, I don't have to erase, or try to salvage it if I don't want to, I can ball it, bin it and start again. It also helps that I draw the characters separately. For the figures, I do utilize a lot of turn-around reference photos Henson provided me of the Skeksis and Mystics. This is an invaluable resource since the puppets are detail on top of details. 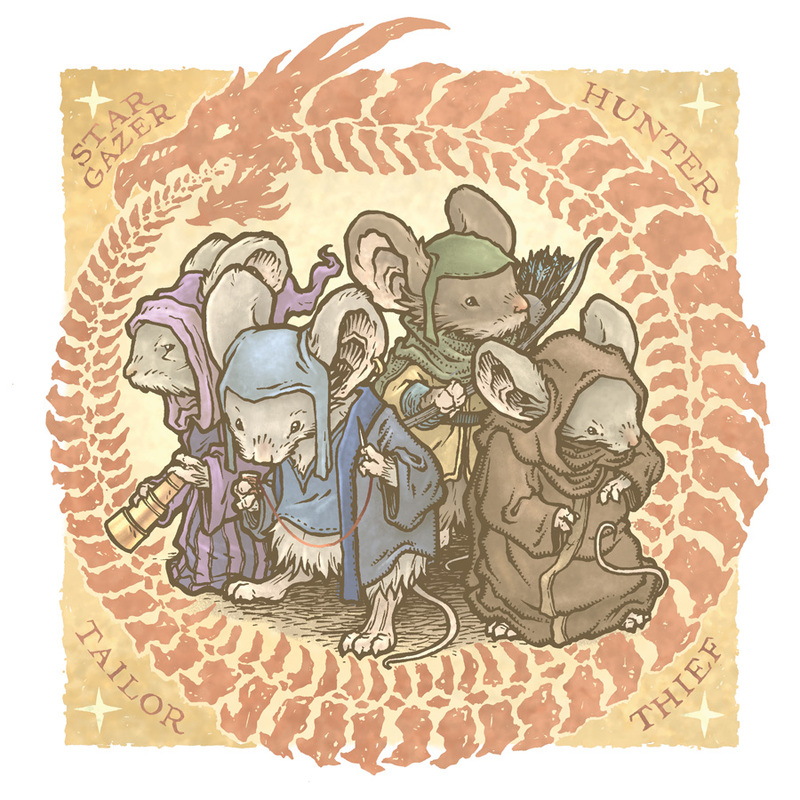 For the background pattern and the celestial design, I directly referenced Brian Froud artwork from the book "The World of the Dark Crystal". With drawings of the characters and background & design, I scanned those in and started arranging and re-sizing them in Photoshop. Because each drawing is separate from the others, it makes this process easier. I tint them different colors to also help me visualize the forms and figure out where the lines from one thing end and the next begin. I've been alternating which direction the figures faced on each cover, so I placed skekTek on a cover where he'd face the right so I could show off his bionic eye and arm. In studying his photos, I think I figured out that part of his costume are Skeksis carapace and a stretched Landstrider hide. Once my Archaia editor Cam and Henson approved the layout, I was able to start inking the final artwork. I printed out the above layout and taped it to the back of a sheet of Strathmore 300 series bristol. On my light pad I can see through the bristol's surface to the printout and use it like a pencil guide as I ink. When it comes to the ink, I use Copic Multiliners. Most of this was done with the 0.7 nib, though lots of facial details were done using a 0.3. Texture and line quality is always my focus when I'm inking. Trying to get the various surfaces to read differently, but also leaving room for color to do some of that work. The first step in the coloring process is to add in all flat colors...no rendering or texture. This is to help establish what areas are the same or different colors. Making sure the Skeksis skin is a different color than the Mystic's, or that the different parts of their costuming are the appropriate colors. It's like coloring within the lines as a professional. In this step I also establish the color hold on the background pattern. The final step is to render the color by adding light, shadow, and texture to the figures. I do all of that work in Photoshop with the dodge and burn tools using a textured brush. So, I have done a reading of it for you all to enjoy and put it on YouTube for a limited time. 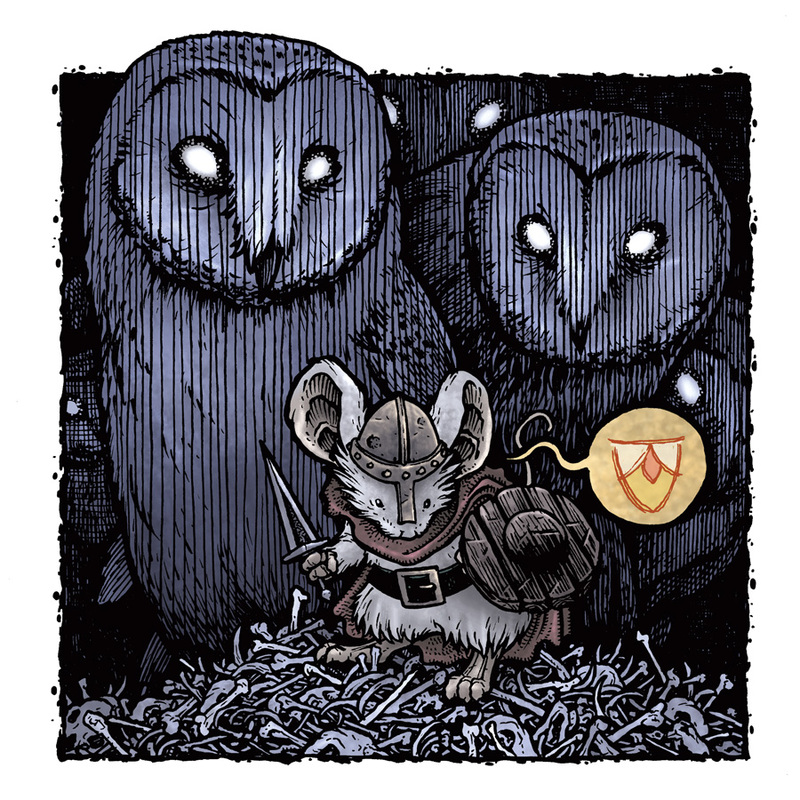 As a theme for my next sketchbook (which was going to debut at NYCC...but will have to wait until later this year or early next) I had the idea of doing Mouse Guard pieces based on specific characters & stories from the guest contributors in Legends of the Guard. (I did a series of these already and shared them in a previous blogpost). 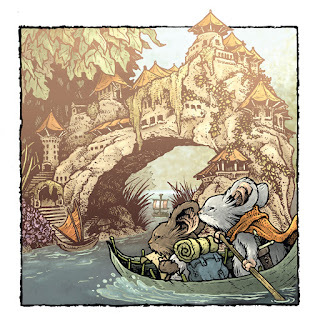 For those who don't know, Legends is a spinoff anthology series where guest artists write and illustrate tall tales, fables, and folklore set in the Mouse Guard world. 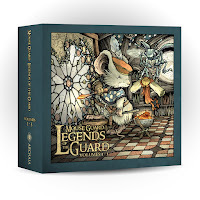 The 3 volumes of Legends are now available in a nice boxed set. 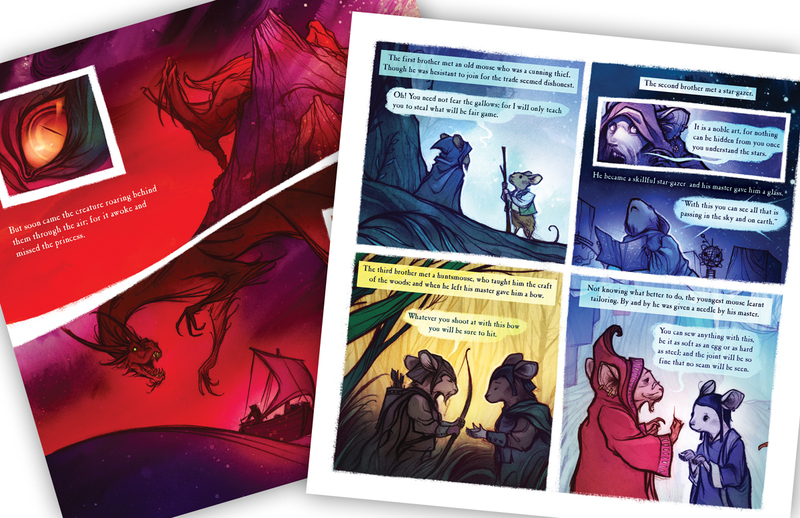 In Volume 1, Jeremy told a story about mice being the servants to larger beasts, doing their bidding as well as fighting their battles for them. 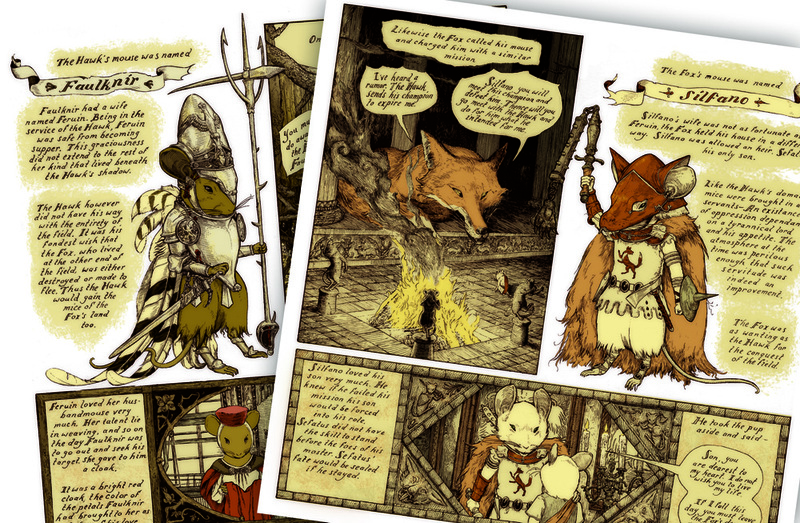 The Hawk's Mouse and the Fox's mouse enter into a combat for their masters, but are halted by the Fox Mouse's son & the Hawks Mouse's wife. 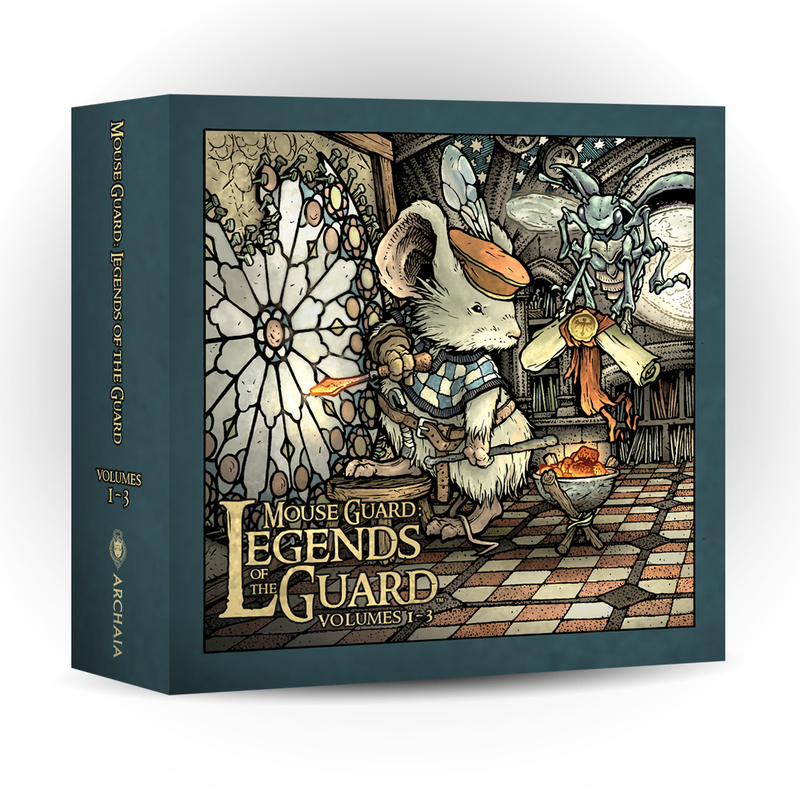 Legend holds them as the first two Guardmice and the wife the Guard's first Matriarch. I've always LOVED this Legend, and I like it better than some of the origins of the Guard in the RPG. 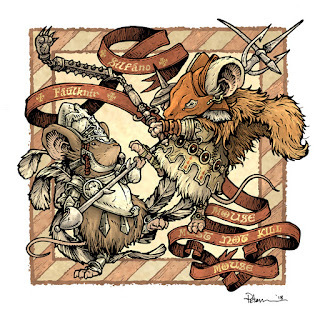 I've tried to integrate these mice into Mouse Guard lore anyhow...Faulknir & Silfano (Hawk's Mouse & Fox's Mouse) have been featured on bookplates, and they along with Sefatus (Silfano's son) were in the story: "Service to Seyan" and Feruin (Faulknir's wife) is imortalized in stained glass in the Matriarch's chamber in The Black Axe. 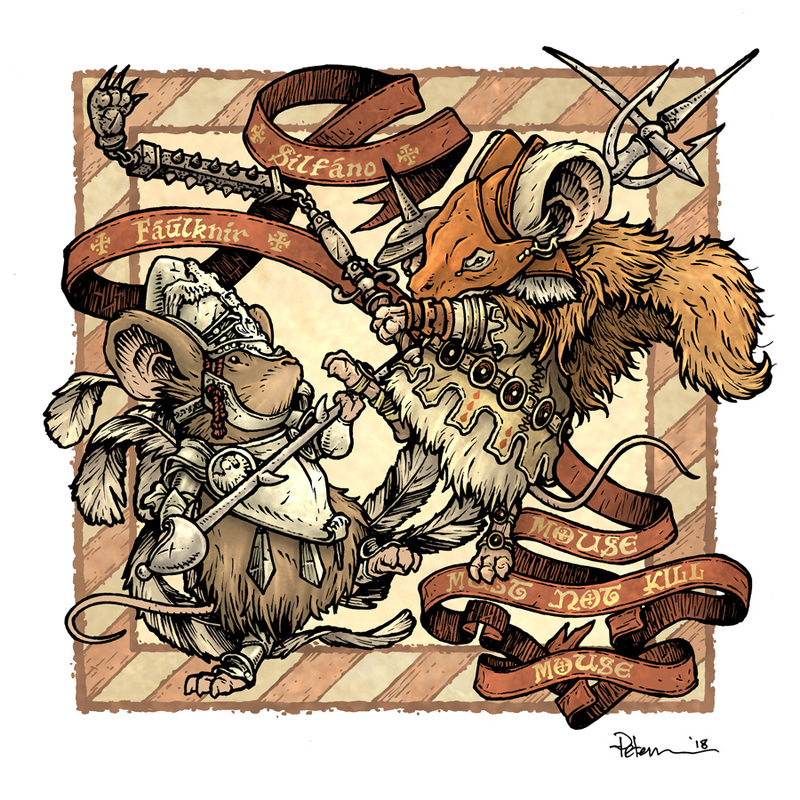 So, for my version of this Legend, I wanted to pay homage to the battle between them were they learn the lesson "Mouse must not kill mouse". 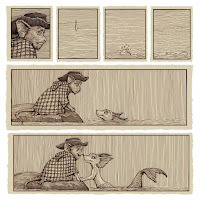 Guy Davis did a wordless story (using pictograms in a few cases) in Volume 1, where a mouse seeing the primitive painting of an owl, gets delusions of grandeur thinking if he says something like the abstracted image he'd become a great mouse. However, when he finds a next of owls, it's a pure horror show...bones everywhere and the discovery that spooky owls are much bigger and more terrifying than the scale-less simple painting. 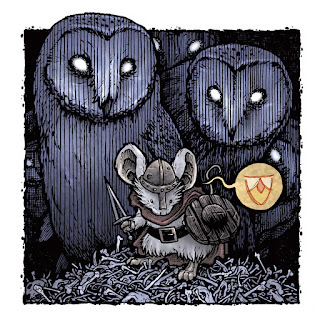 I wanted to show the moment of dawning realization where the mouse has seen the bones, but not the owls haunting him from behind. As an extra nod to the story (so the reference to it is clearer) I added in the pictogram speech of the owl painting. 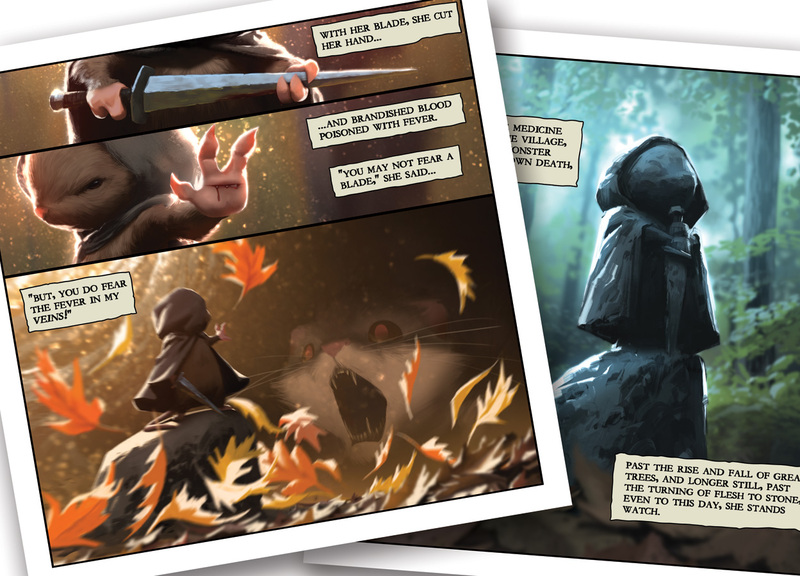 In Volume 2, Cory told a story of four brothers who each learn a specific trade: thieving, star-gazing, hunting, and sewing. 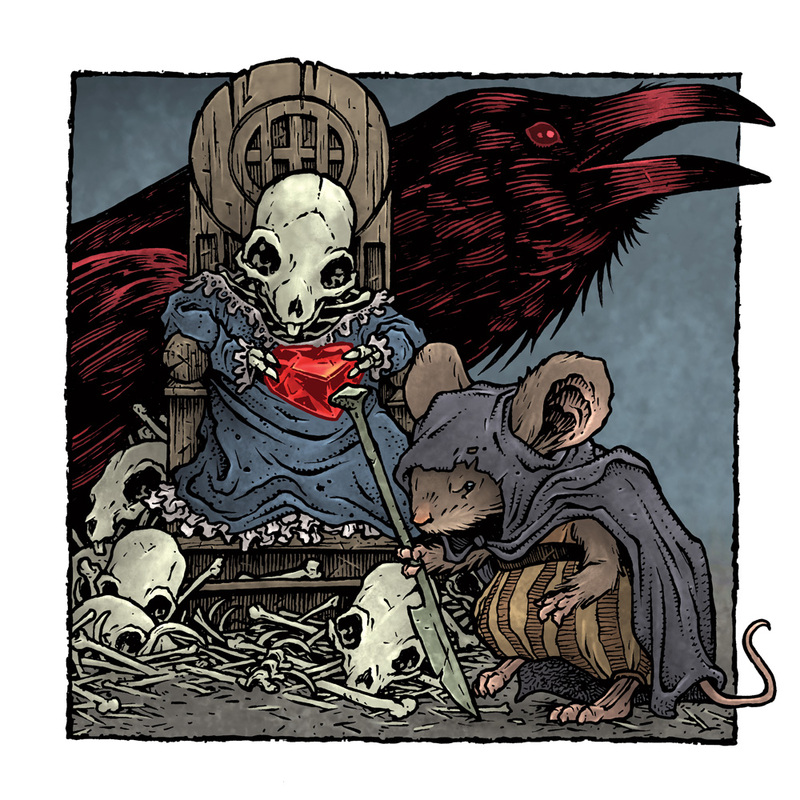 When they are reunited they are called to aid a mouse king whose daughter has been taken by a beast and they each must use their specific skills to rescue her toegther. 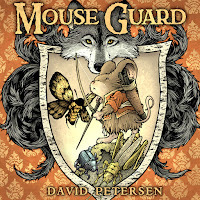 Because I like Cory's dragons, I bent the Mouse Guard rules for non-regional animal species (or in this case, imaginary. 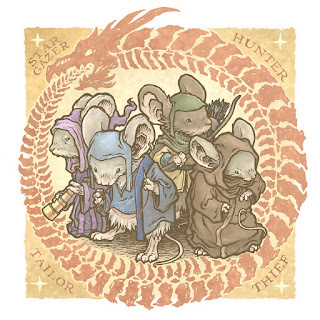 For my portrait of the brothers, I wanted to include that dragon, but to bring it back into some more familiar Mouse Guard territory, I referenced the visual of a snake eating its own tail, but now with a dragon head. Nate's story from Volume 1 is only three pages (a restriction I had to impose on him because of a miscommunication from the other contributors in that issue) but it doesn't feel small. 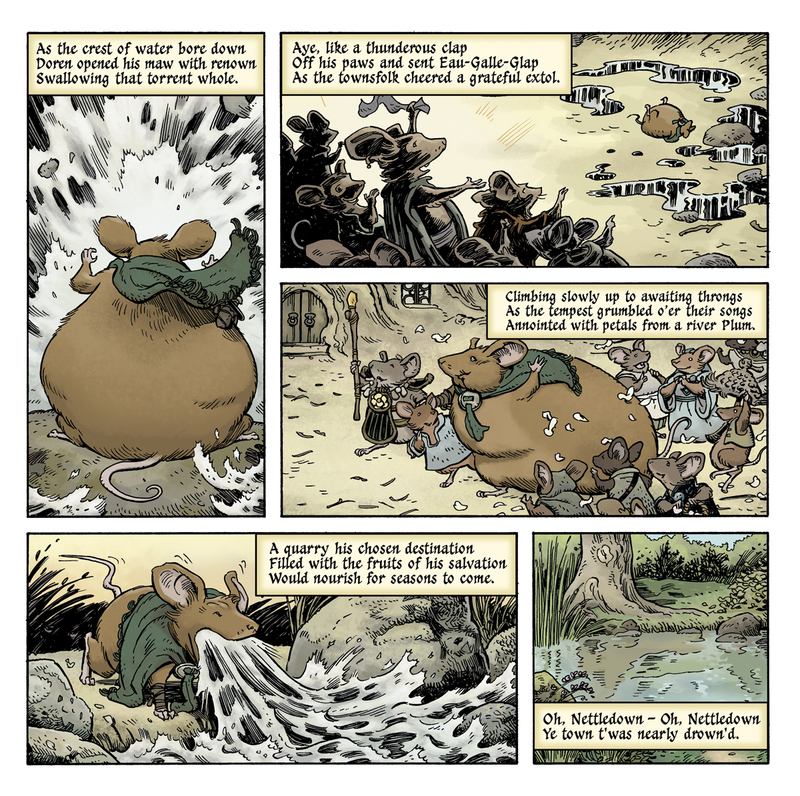 It tells the story of a mouse who saves the town of Nettledown from a flood by drinking the all water before it reached the village. I've referenced this tale twice in Mouse Guard, Doren can be seen in the feast in Seyan in "Service to Seyan" and the town of Nettledown works into some past Black Axe lore in "The Axe Trio". It was hard to pick a moment in this story to draw, and I worried no one could draw Doren better as a big sloshy impossibly overfilled mouse, but I did my best while including some of the townsfolk I was drawn to. 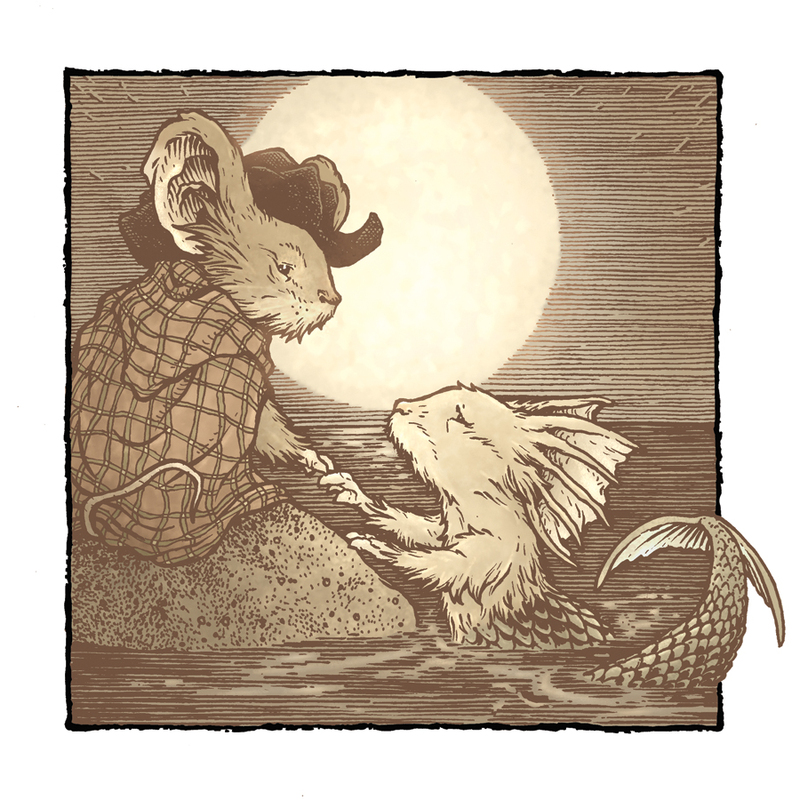 In Volume 2, Christian did a story about a young pirate-y mouse who rescues a female mer-mouse from a sea creature. They emotionally connect before she swims away. 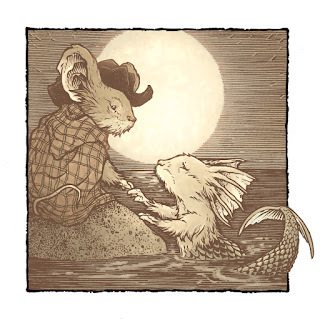 We watch the Pirate mouse age and return to the sea edge as an old fur..he sheds a tear and she reappears and they sit on a rock and watch the moon. 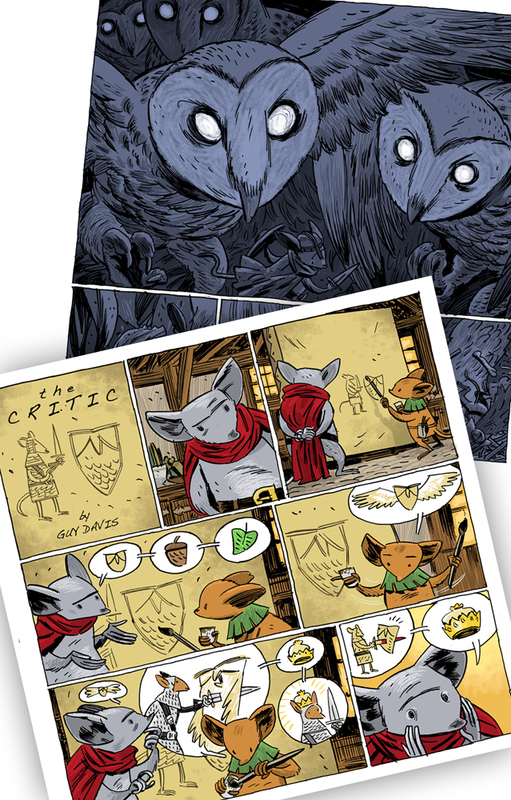 I tried to keep the muted palate and hatched linework feel of Christian's pages, and simply just redrew one of his panels (adding in the moon from the last page of the story) in my own style. 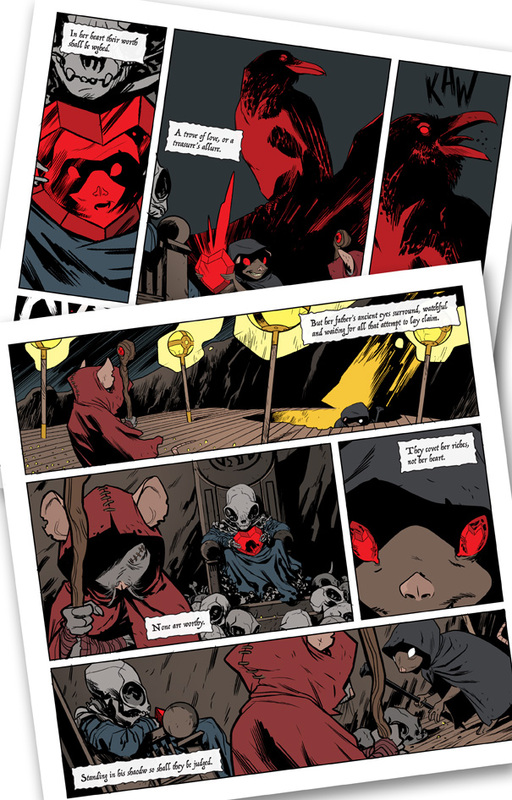 Jackson had never drawn a comic story before his Legends tale. He's an amazing concept painter for the Marvel movies, but to make up a narrative and tell it panel by panel was something new for him. I loved the concept paintings he'd done of exotic locations in his sketchbooks, so I suggested a travelogue type story, with a Guardmouse escorting a cartographer around noting things of interest/danger at each one. 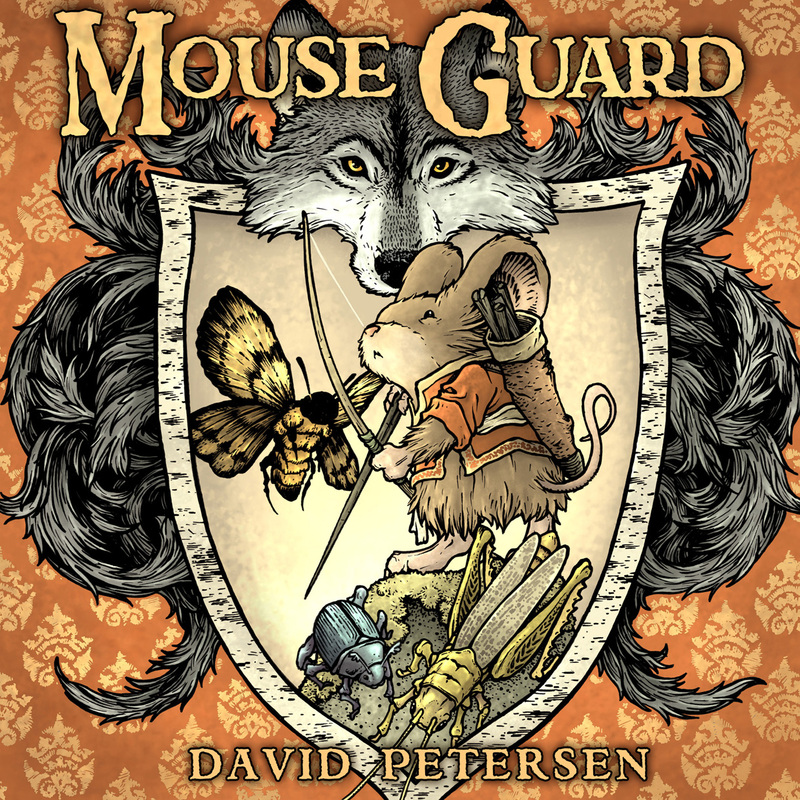 He added a nice tone of the Guardmouse feeling it was somehow beneath him to 'babysit' a mouse to write notes and draw maps, but in time he's won over by the adventure and usefulness of it. For my version, I just tried my best to reinterpret Bridgeporte in my inked illustrative style to see how it would look. I included the two mice in the foreground paddling in their approach. The skeleton holding the jewel is what I most wanted to draw for my version. And it only seemed logical to include the mouse thief as well as the crow. Ryan Lang's Legends story is one of the most shared and was and important story in terms of landing some of the pieces to get the Mouse Guard movie deal in place. 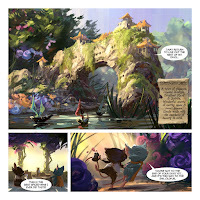 Ryan has worked in animation for years, but I think this was his first published sequential comic work. 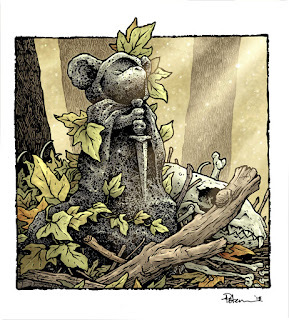 Beautifully painted, The Watcher's Stone is about a mouse who stands sentry over a mink's lair to keep her town safe. But she doesn't use brute strength or her sword to keep the mink at bay, she holds it prisoner by using what it fears the most against it. And the Legend goes that she stood there so long, she eventually turned to stone, leaving an eternal landmark at the spot. 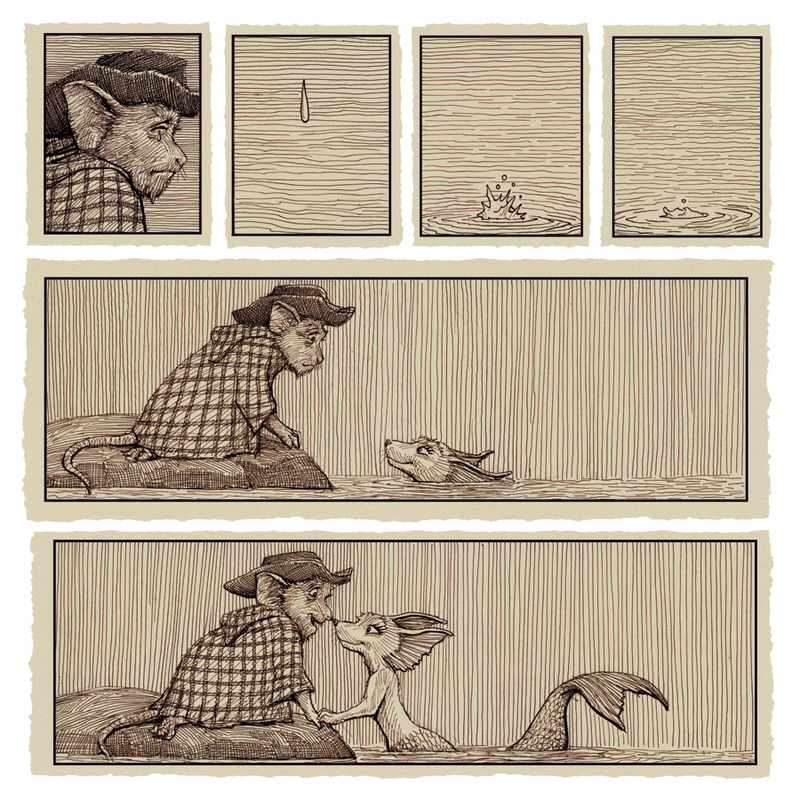 It was hard not to just recreate the last panel and reveal of Ryan's story for my homage. I tried to play up the ink textures and line to make sure it was my own. I also had the mouse's ears exposed, as I can never seem to pull off the mouse hood with the ears tucked inside without it looking wrong. 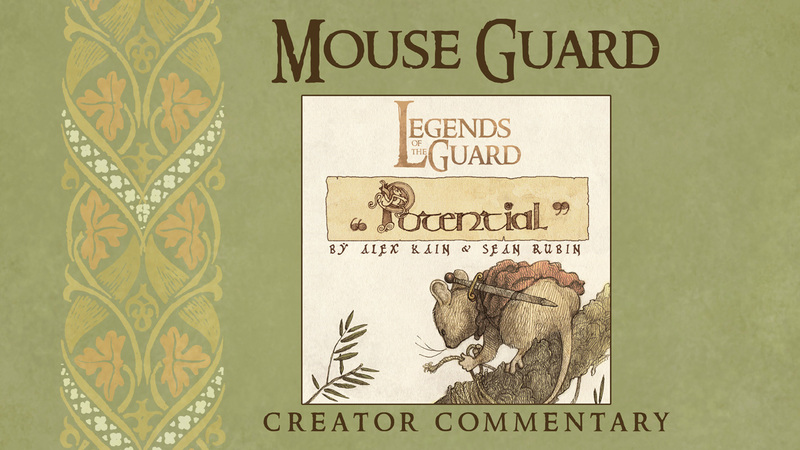 I've made a Creator Commentary video for the short story from Legends of the Guard Vol. 1: POTENTIAL. 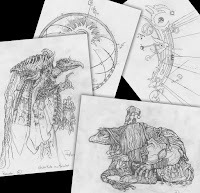 Joining me on the video are the creators of that story, writer Alex Kain, and artist Sean Rubin. Watch the video below as we go page by page and panel by panel with behind the scenes info, inspirations, art & story notes, and reference. Enjoy!